Curran grew up in the San Francisco Bay Area where her love of tennis began. There she played eight years on the USTA junior circuit reaching as high as #50 nationally. Her career continued as she competed for 17th ranked Division 1 UC Santa Barbara. She previously taught at the famous John Gardiner’s Tennis Ranch in Carmel Valley, California as well as the luxurious Claremont Resort in Berkeley. 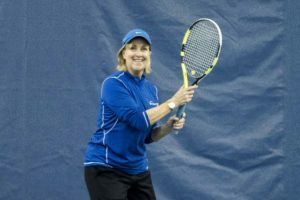 For one summer Curran taught tennis at Club Med in Marbella, Spain where her fluency in French came in handy teaching the predominately French guests. Curran is a certified PTR instructor and enjoys working with players of all ages and skill levels. Her outgoing personality and caring approach make her a very amiable teacher at Foreside Fitness & Tennis. She is a longtime resident of Falmouth where she lives with her husband, 3 children and dog Ozzie. Look better, feel better, change.